Makeup Remastered- reinvent yourself daily: Tom Ford in Aphrodisiac 19 - wallflowers need not apply! Tom Ford in Aphrodisiac 19 - wallflowers need not apply! This bright fuchsia lipstick came with the Fall/Winter 2012 collection. It forms part of their permanent collection as well. Aphrodisiac (#19) is well pigmented, creamy, long wearing and hydrating. This pink will work on all skin tones from pale, olive to dark. It reminds me of Miami, drinks with umbrella's and breezy dresses. Yes, I know it formed part of the fall/winter collection, but this colour will work all year round. As with all Tom Ford lip colours, Aphrodisiac is so comfortable to wear, as like all other TF lippies it contain soja seed extract, Brazilian murumuru, chamomilla flower oil. So, I guess besides the gorgeous packaging this is where your money is going - top notch ingredients. With one swipe you get maximum, even intensity which over a few hours wears down to a stain. Tom Ford loves for both his eyes and lips to have impact. Aphrodisiac stays true to this ethos. 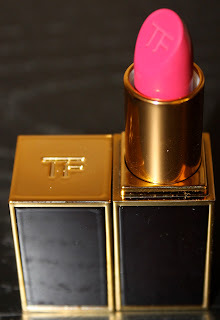 This is my second Tom Ford lip colour and I love it. Do you have a favourite Tom Ford Lip Colour? Tom Ford are available locally and exclusively at Stuttafords - cannot wait until the whole Tom Ford line becomes available as Tom Ford has just hit Hong Kong- so holding thumbs!